Jelisavka is a highly qualified Special Education Teacher. Graduating from The Faculty for Special Education and Rehabilitation University of Belgrade in 2010, Jelisavka has vast experience working with children and young people across a number of settings. She specializes in supporting children with behavioral problems, learning difficulties, neurological disorders and more. Jelisavka has also completed numerous projects supporting children in areas such as strategies to manage challenging behavior, developing social skills, creative art and craft to further develop emerging skills and settling into school settings. She also coordinated a program which offered training to educate parents in supporting their child’s needs. She is a well-rounded educator who is able to see the child as a whole focusing on each area of development. 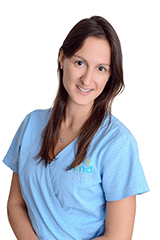 Jelisavka is excited to bring her wealth of knowledge and experience from her previous roles to Mind Institute.